Palestinian leader Mahmoud Abbas says he is ready to travel to Gaza to try and end the division between his Fatah party and the Islamist movement Hamas. Mr Abbas has not set foot in Gaza since the violent split in 2007 which left Fatah in power in the West Bank while Hamas was left to run Gaza. 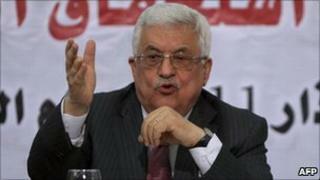 Hamas, who on Tuesday invited him to come, has welcomed the move. The thaw in relations comes after mass demonstrations in several Palestinian cities calling for national unity. "I am ready to go to Gaza tomorrow in order to end the division," Mr Abbas said in a speech to the central council of the Palestine Liberation Organisation (PLO). A senior official from Hamas, Sami Abu Zuhri, gave a positive response to Mr Abbas, saying preparations would be made for his visit. Both parties seem to be responding to the recent demonstrations that were inspired by the uprisings elsewhere in the Middle East, reports the BBC's Jon Donnison from Ramallah. But Palestinians will not be holding their breath that the feud will end, says our correspondent. For years, they have heard promises and pledges that their leaders would try to end the division, all of which have come to nothing, he adds. Meanwhile, doctors in Gaza said at least two Palestinians were killed in an Israeli airstrike in the central Gaza Strip. The Israeli army confirmed the attack, saying it was responding to rockets fired from Gaza. Israel says militants have sent dozens of rockets into Israeli territory since the start of the year. Before Wednesday's incident, UN figures showed at least eight Palestinians had been killed by Israeli military action in Gaza in 2011.